Place a portable burner in the middle of the dining table. Place a large pot on the burner, and fill with stock, ginger, carrot, and a few shitake mushrooms. Turn the heat to medium, and bring to a simmer. As the broth is heating, arrange the seafood, vegetables, tofu and noodles on platters. To small bowls, add the soy sauce, Ferguson lobster oil, and chilli flakes for dipping. Once the broth is simmering, each guest dips some ingredients into the pot until cooked. They then retrieve their ingredients, and ladle some broth into their bowl. Place a large pot over medium heat and fill with stock, ginger, carrot, and a few shitake mushrooms. Bring to a simmer, and cook for 10 minutes. Add the Ferguson bight redfish fillets and prawns, and cook for 1 minute. Add the squid, mushrooms, bok choy, Chinese spinach and tofu, and cook for another minute. 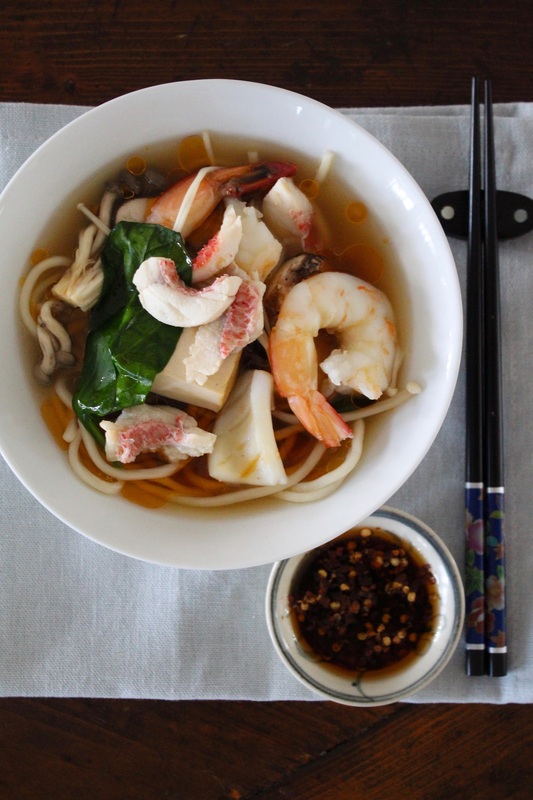 Divide the noodles between six bowls, and top with broth, seafood, vegetables and tofu. Drizzle with soy sauce, Ferguson lobster oil, and chilli flakes, to serve.